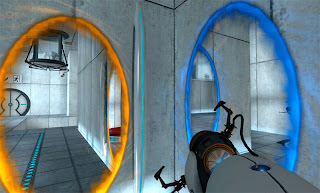 My love for Portal, Portal 2, and video games in general is certainly no secret. Nor is my love for comics and other geekery. Recently I played through the Portal 2 single- and multi-player campaigns (with my Activision and Call of Duty buddy, Bryan). Of course, me being... well... me, I couldn't help but think about why I loved the game and then a bunch of weird brainy neuro stuff. Basically the end result of my over-intellectualization was that sometimes games are just fun. That's it. End of post! Hope you enjoyed it. Okay,I guess I can continue on. For science. Or rather, for neuroscience. If you're unfamiliar with the Portal games, a wonderfully homicidal AI is trying to murder you in the name of advancing science. Your goal is to stay alive by surviving her tests using only a gun. But this is a special gun. It creates portals that allow you to teleport between portal A and portal B. Momentum, a function of mass and﻿ velocity, is conserved between portals. In layman's terms: speedy thing goes in, speedy thing comes out. This game has some ridiculously crazy 3D spatial reasoning puzzles and I got to thinking about how the hell I was able to shoot a portal at a wall, shoot another across the room, and know that when I went into one I would come out the other. There's a lot going on here to let the brain do this! Get all that? There's a reason why scicurious gets motion sick when she tries to play the Portal games. In this post I'll give a brief introduction about how the human brain can even conceive of teleporting between two portals. More specifically I'll talk about visual attention and working memory. You can't really conceive of moving from portal A to portal B without first knowing where the two portals are relative to each other and to the room you're in. I want to make it clear how hard it is to study something like spatial attention and memory. These concepts are more metaphors or placeholder terms we use in neuroscience to describe observable psychological and behavioral phenomena than actual brain processes. They're kind of ill-defined and nebulous, though there's a massive literature that attempts to unite the behavioral with the neuronal. The first mind-blowing spatial attention thing to know about is hemispatial neglect. The most common form of hemispatial neglect results from damage to the right posterior parietal lobe. It manifests as the inability to conceive of or see one visual hemifield. Literally, there is no conception of "leftness". The above examples are of two drawings from a patient with hemineglect. Notice that, when copying a drawing, the patient is missing the whole left half of the object. And when free drawing, they show a similar effect. There's a great review on this topic by Masud Husain and Chris Rorden from 2003 in Nature Reviews Neuroscience. In that paper the authors do an amazing job summarizing what we knew about neglect at the time. I'll also take this moment to emphasize yet again how much we've learned about human cognition from work done with patients with brain lesions. Visual attention is an enormously huge domain that strongly overlaps with research into visual working memory. 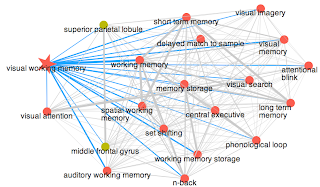 The mechanisms underlying visual working memory have recently become controversial. One account proposes a small number of memory "slots", each capable of storing a single visual object with fixed precision. A contrary view holds that working memory is a shared resource, with no upper limit on the number of items stored; instead, the more items that are held in memory, the less precisely each can be recalled. This all stems from George Miller's famous paper from 1956, The magical number seven, plus or minus two: some limits on our capacity for processing information (decent Wikipedia summary here). (In fact, I believe a big chuck of working memory research is conflated with attention... I've got a project to try and demonstrate just that). The number of experimental paradigms used to study attention and/or working memory is enormous so, although there are fairly "standard" paradigms, even slight differences between stimulus presentation, timing, task, etc. can lead to fairly big differences in results. However, the visual experiments that require a person to sit in a darkened room while some images flash at them on a computer screen has lead a number of researchers to call into question what is actually being tested in these situations. Does remembering when an X appears on a screen really encapsulate human memory? Does noticing a green square in a sea of red squares typify attention? Of course, more ethological ("real-world" scenario) experiments sacrifice control for validity... making the whole damned thing a mess. I've just been looking at conceptualisation of 'difficult' gaming spaces (like portal, shift, company of myself, etc) and how people adapt to them. Seriously though, would love to see more on this one. I have had an XBox 360 for three months now. I have one game. That game is Portal. And I love it. I can't wait to see what comes from a generation raised on games like Portal as opposed to games like ... um ... Wolfenstein 3D or Space Quest. Any pointers for good review papers on attention and visual working memory? This talk I ran into by Robert Desimone on neural synchrony and attention has piqued my interest (http://www.youtube.com/watch?v=GdDMzV26WSk). Jeff: Desimone and his scientific progeny (Earl Miller, Pascal Fries, Jonathan Wallis, etc.) are doing such super cool electrophysiology. Check out anything by those guys and you won't be disappointed. I'd recommend starting with Fries and moving on from there.